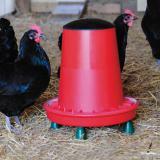 Designed for ground based poultry feeding. 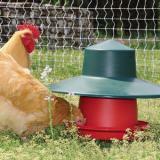 Protect your chicken feed and reduce waste by using an Eco Rain Hat with the Eco Feeder. 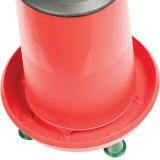 Designed for ground based feeding. Includes a set of 4 push fit legs that raise the feeder 3 in. off the ground. Has a wide lipped bottom feed tray with an indoor lid. Lower portion of the cone is non-reflective. Helps flighty birds from seeing their reflection and getting scared. Optional rain hat (sold separately) to protect feed from inclement weather. 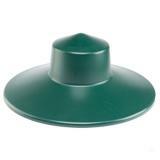 Love these, I did get the hats so no water in food when it rains, love it. I love this feeder. It holds plenty of feed with no waist. I did get the one with the grill. I think that is why they can't dump anything out. 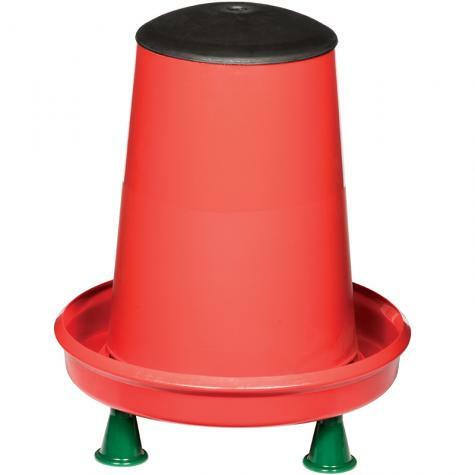 this is fabulous, works great for chickens and small ducks, saves on food and holds lots of food! I bought the Eco-Feeder (without grill) for our ducks and I am very satisified with it. 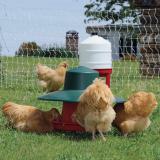 I have one with the grill too, but felt that they needed more room to get to the feed with their larger bills. I can tell that they prefer the feeder without grill as they eat more feed from that one. 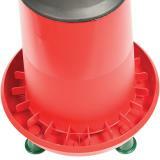 I would recommend this feeder for ducks. Prefer over hanging feeders. Large space for birds heads/bills. 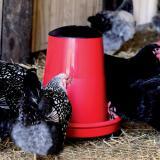 Sturdy, cap is great for keeping Guineas out of the top.